Enjoy a small-group 8 to 9 hour guided tour of Niagara Falls from Toronto. Travel with only 3-14 people per tour group. Your tour guide will pick you up and drop you off at your downtown Toronto hotel or location. The tour includes historic sights, as well as a visit to the picturesque town of Niagara-on-the-Lake and free time at Niagara Falls (where you can ride a boat and climb the Skylon Tower among other activities). Your guide has over 25 years of experience and is extremely punctual, knowledgeable, friendly, entertaining and most importantly, a safe driver. Your day begins with pickup from your hotel or the agreed downtown location from around 7:30am (we leave a little earlier than others so we can beat traffic, and beat the large crowds at Niagara Falls - you will see this is a HUGE benefit). After meeting your guide, enjoy a narrated drive to Niagara Falls for 3 hours of free time. During this time, you can walk around the strip and participate in activities such as the famous Hornblower boat cruise. Please note that attraction costs at Niagara Falls are extra and can be paid at the ticket booth. 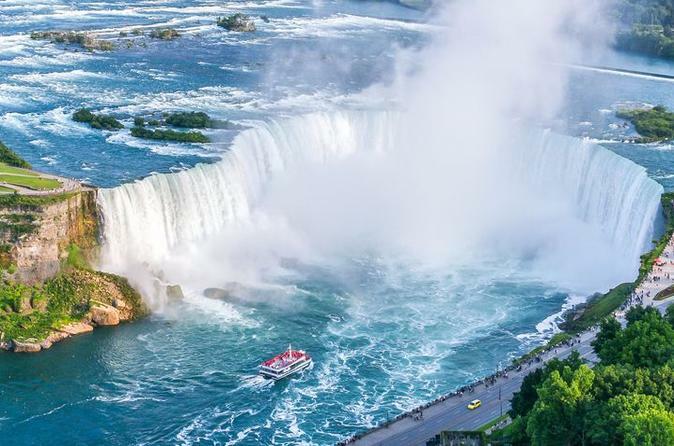 Next, you will visit famous sights such as the Niagara Whirlpool Rapids and the Niagara Hydro Dam, and enjoy a scenic ride across the Niagara Parkway. Please note that these sights may vary and are based on timing and season. You will also have around half an hour to walk through Niagara-on-the-Lake, one of Canada's most beautiful towns. Finish the day with a visit to the Niagara Wine Region and a free wine tasting. Brace yourself for the famous Niagara Icewine! You will then be dropped off at your hotel or the agreed drop off location between 4:00pm and 5:00pm (depending on traffic, this may be later).